This is most interesting and it works very well. Load the iRacing simulation in a test session with a favorite car and track. Drive at least two laps. Stop anywhere and press F9. That brings up the Graphics Adjustment black box, shown to the right. FFB strength is shown at the bottom of the black box. If you made at least two laps you will see auto in the lower right corner. Click auto to set your force feedback for this car. To save your force feedback for this car, you need to click Options. 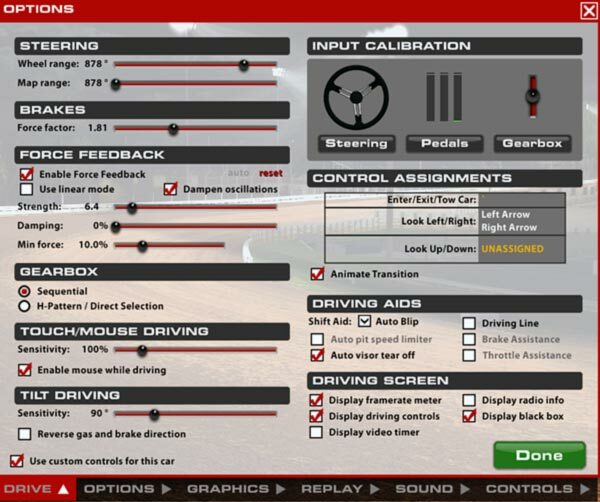 In the lower left corner of the Options screen, click Use custom controls for this car, as shown below. 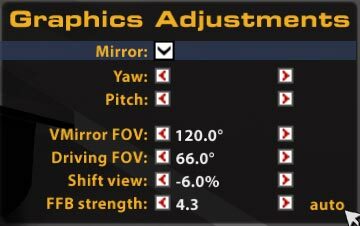 By using custom controls for each car, you can set different force feedback levels for each car that you drive. Note: I don’t run these Wheel range or Force Feedback settings any more. Here’s what I am running on dirt ovals now.